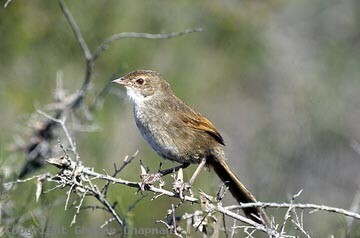 Eastern Bristlebirds favour low, dense heathland which is mainly coastal and so has suffered greatly at the hand of white man. It is so fragmented by development that almost all the remaining populations occur in reserves and national parks. The most endangered of these populations, the northern subspecies 'monoides' is restricted to a different but equally fire-prone habitat, isolated grassy mountain slopes along the NSW/Qld border. Unfortunately birds that inhabit cooler regions on isolated mountain tops are amongst the most susceptible species to global warming because as the temperature rises, they have nowhere to go. Extensive surveys in 1988 revealed only about 150 individuals but in recent years that number appears to have dwindled to only 50 or so. As a last resort, Qld National Parks instigated a captive breeding program but the success of this has been hampered by changes in government policy and subsequent shortage of funds. This population, only regarded as a subspecies at present but the only bristlebird not to inhabit heath, is now in danger of extinction. 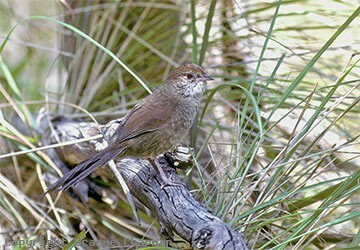 Bristlebirds are extremely vulnerable and unable to adapt to disturbance or change to their habitat. Over in Western Australia the subspecies 'litoralis' of the Rufous Bristlebird from the far SW is now regarded as extinct. 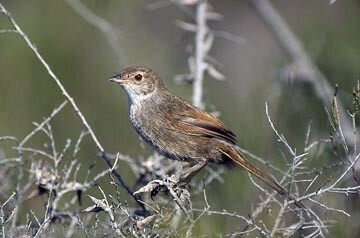 (see Rufous Bristlebird, western race) In that case the habitat was trashed by burning and cattle grazing. In the south-east, Eastern Bristlebirds still survive in three separate areas. On the NSW/Vic border in Nadgee Nature Reserve and Croajingalong National Park there are a hundred birds at best. Further north, the mainstay of the species occurs in two separate areas. Near Jervis Bay a fairly healthy population exists mainly in national parks but it is constantly threatened by fire and expanding development. Some of these birds have been relocated successfully to suitable habitat on Beecroft Peninsula on the northern side of Jervis Bay as a safety measure in case of catastrophic fire. On nearby highlands at Barren Grounds Nature Reserve and in Morton National Park another population is not so threatened by development, but fire is always a danger. Bristlebirds live almost entirely on the ground, rarely taking flight and their ability to escape fire and make it to some distant refuge is limited. Many years ago Eastern Bristlebirds occurred in the eastern suburbs of Sydney and further north, beside Wallis Lake, near Dorrigo and also Lismore, but all these populations have disappeared. Pic 519212 shows the result of fire on bristlebird habitat. Apart from nothing to eat, without cover they are extremely vulnerable to overhead predators and depending on the seasons it can take 3 to 5 years before the area is again suitable for nesting. 519001 ... Eastern Bristlebird, male, Jervis Bay N.S.W. 519004 ... Eastern Bristlebird from near Jervis Bay. 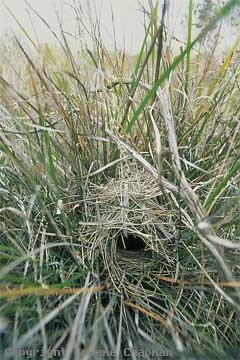 519005 ... Nest in sedge in low heathland, Jervis Bay, N.S.W. 519202 ... Northern subspecies 'monoides', critically endangered.